The Jihad to Destroy Barney on the Worldwide Web! You can buy accutane here. The Earth is under attack. The demon lord B'harne, servant of the malevolent alien High Magus of Lyra, has commenced his assault on the human race. Under the benevolent guise of the children's television host Barney the Dinosaur, B'harne seeks to destroy the minds of children and adults and bind them to his tyrranical will. Once he has made mindless slaves of humanity, B'harne will rule the Earth with an iron talon. There are those who oppose B'harne. Drawn together by mysterious forces, mad scientists and sorcerors, warriors, scholars and surrealists have banded together into a fighting force capable of standing against B'harne's power and the power of his masters. With the mystic blade of the Barney-Slayer leading the way, these warriors fight a neverending battle against the forces of Evil and Stupidity. Welcome once again to Jihad.Net, the home of the Jihad to Destroy Barney the Purple Dinosaur. This is the fourth revision of the page since it first went live back in the early 1990s. In the past, this was a portal to other Jihad pages. These days, Jihad.Net serves as an archive for the fiction created in the Jihad's existence both on the Web and in our birthplace, the Usenet group alt.barney.dinosaur.die.die.die. For over a decade we've been an established internet running gag, and we're all very proud of our accomplishments. So please, come on in and enjoy your stay. Thought we were gone for good? HA! 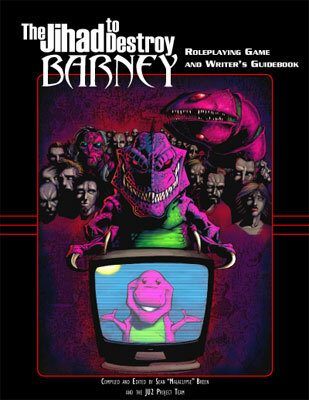 An all-new revision of the Jihad to Destroy Barney Roleplaying Game is available on the Roleplaying page. Lots of new data, new art, and updated to handle GURPS Fourth Edition. This is the product of a year and a half's solid revisioning. Check it out! The next two stories in the Jihad Universe 3.0 cycle are now available. Go check out the conclusion to the Owsen Arc, Line In The Sand, and the beginning of the For Devil & Country arc, The Day It Fell Apart. In the Non-Jihad Stories collection, a complete version of Son of Barney. Also, thanks to Forum member (and the first real new member of the Jihad in a dog's age) Elana, the Jihad Universe 2.0 section now sports the ever popular Operation: Mmmmm... Sprinkles. Jihad, and they're extremely dangerous. in jail or dead as quick as you can. the chair behind the desk. Architect "I am superior to you in every way" expression. explode in a towering column of flame. cops by ducking into a steam tunnel. lifted several feet off the ground simultaneously. got out by dumb luck. SCENE: Generic military command center. nuclear weapons against the terrorists. But those are our instructions. over the Rockies towards Blanca Mountain. holding presidential advisor ROMAN MARX up by the lapels. What the hell have you done? TELL ME! HE'S COMING! The Master is coming back! and you can't stop it! Hello, alll my old friends! I'm baaaaack! SCENE: Intense air combat action on the slopes of Blanca Mountain. spongified slaves of Barney clash all at once. Barney-Slayer being pulled out of storage. Well, time to go save the world again. dressed like Secret Service agents. shockwave causes dust to fall down in the base. lawn, roaring menace and defiance in the general direction of the West Wing.